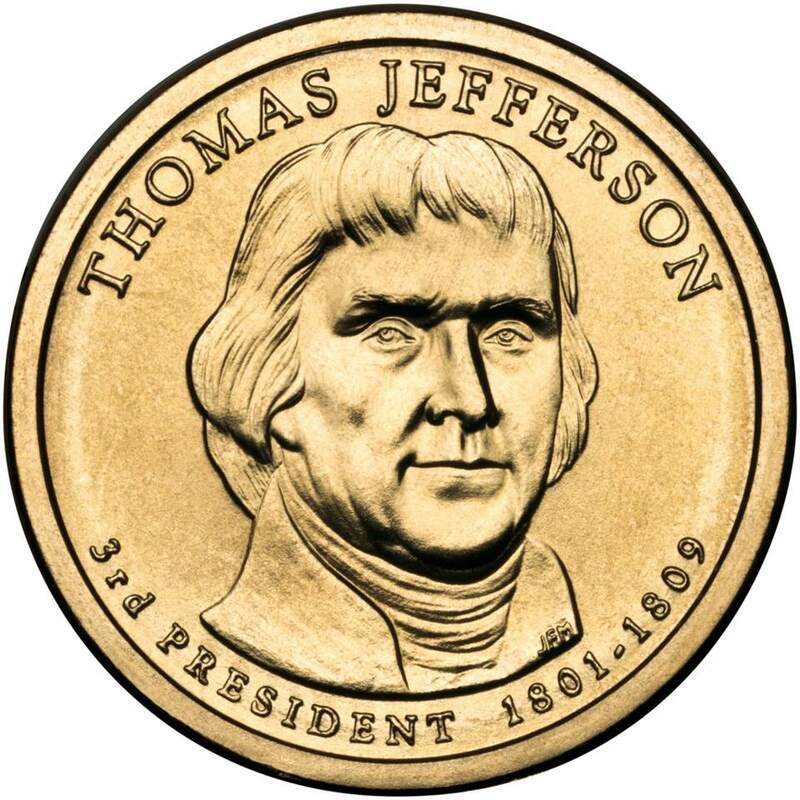 The Thomas Jefferson Presidential Dollar is the third in the multi-year Presidential Dollar coin series and was released into circulation on August 16, 2007. The day before the general release, the U.S. Mint held an official release ceremony at the Jefferson Memorial in Washington, D.C. One of the highlights of the release ceremony was the unveiling of results from the Mint's Gallup Poll where the Mint, asked Americans some basic questions about the first four U.S. presidents. The Presidential $1 Coin Act (Public Law 109-145) enabled The United States Mint to produce one dollar coins featuring each of the presidents of the United States. The law further stated that each president to be featured must have been deceased at least two years before appearing on a coin. in 2007 and 2008, these coins were known as "Godless Dollars." This was due to the edge containing the engraved text of "E Pluribus Unum", the coin's mint mark, its year of issuance, 13 five-pointed stars, and "In God We Trust". Congressional law required that beginning in 2009 "In God We Trust" be moved to the obverse of the coin. Joseph Menna designed and engraved the obverse of this presidential coin. The reverse features a standard design sculpted and engraved by Don Everhart. Each coin is composed of core of pure copper with manganese brass cladding (88.5% Cu, 6% Zn, 3.5% Mn, 2% Ni). Thomas Jefferson is one of our nation's favorite founding fathers and has been featured on several U.S. coins before the Presidential Dollar that honors him. The most well-known is the nickel. Jefferson's portrait had appeared on the nickel since 1938 when the design was changed from the Buffalo nickel. Jefferson has also appeared on two commemorative coins. The first one was a gold Dollar issued in 1903 to commemorate the Louisiana Purchase Exposition. The Purchase was negotiated 100 years earlier by Jefferson during his first term as president. The other commemorative coin to honor Jefferson was a silver dollar issued in 1993 to commemorate the 250th anniversary of Jefferson's birth. It featured a portrait of Jefferson on the obverse and his residence, Monticello, on the reverse. Thomas Jefferson also appears on two additional coins issued by the U.S. Mint, although the coins aren't specifically about him. The South Dakota Statehood Quarter, released in 2006, depicts Mount Rushmore, of which a sculpture of Jefferson's face is a part. Another coin which commemorates Mount Rushmore is a Half Dollar issued in 1991 to note the 50th anniversary of this majestic mountainside sculpture. Jefferson also appears on the U.S. $2 bill and the $100 Series EE Savings Bond. Jefferson ran for the United States Presidency against John Adams in 1797. As the second vote-getter, he attained the office of Vice President under Adams as a result of the way the Constitution stipulated such things should be done at the time. Jefferson went on to be elected President in a very close electoral situation in 1801, eventually serving two full terms until 1809. Some of the significant events that took place during Jefferson's presidency included the negotiation of the Louisiana Purchase and the seminal Lewis & Clark Expedition, (which included among its party a young Native American girl called Sacagawea, who also appears on a U.S. Dollar coin.) Jefferson faced down international threats to U.S. shipping interests by sending the nascent U.S. Navy to suppress the Barbary Coast pirates, and he walked a fine diplomatic line to keep the U.S. from becoming involved in the strife between England and France. Although Jefferson's first term as president largely enjoyed public approval, he ran into problems in his second term. Although he had done whatever he could reasonably do to protect the interests of U.S. shipping and international commerce during his first term, the situation between England and France deteriorated to the point where U.S. ships were no longer able to trade with these nations as a neutral entity. Both countries took hostile actions against U.S. shipping to prevent the opposing nation from benefiting from the commerce, and Jefferson's solution was to embargo all foreign trade where U.S. ships entered foreign ports. The Embargo Acts were disastrous to segments of the U.S. economy, and Jefferson was an extremely unpopular man when he left the Presidency.